What happens when a licensed Smartsheet user leaves the company? How do you transfer owned sheets to another person or remove the user altogether? How do you add non-licensed users to your Team, Business, or Enterprise account? These issues all fall under the realm of the SysAdmin. The SysAdmin is a role specific to Team, Business, and Enterprise plans. They are in charge of managing the account by adding, editing, and removing users, and transferring ownership or removing access to shared sheets. In other words, the SysAdmin is responsible for managing users. And a lot can change when managing dozens, or even hundreds, of users. Invite a member of your billing or finance department to the account so he or she can easily login and download receipts of payment and update billing information at any time. Click Account > User Management > Add User to send an invitation to your finance representative's email address. Check the box to offer SysAdmin access, and un-check the box for Licensed User access. By un-checking the box for Licensed User access, the finance representative won't be able to create sheets and the extra member won't count against the user limit included with your subscription. As a SysAdmin, the finance representative will be able to login to Smartsheet and click Account > Account Admin to View Receipts & History as well as Edit the Address & Payment Info on file for the account. Unless you provide SysAdmin access to someone else, you are the only person who is able to invite or remove users on the account, cancel or change the subscription, or transfer sheets between users. Though this may not initially pose a problem, but what happens if you're on vacation and for security reasons, someone needs to be bulk removed from all sheets immediately? Or, what happens if you move to a new position at another company, but your old company wants to continue using Smartsheet? To prepare for this, invite an alias email address (e.g. [email protected]) to the account as a SysAdmin, and similar to the above tip, un-check the Licensed User option. We do not recommend inviting an alias as a Licensed User as this could lead to sheet collaboration issues. The idea is that the alias would be a last resort, a backup option, as opposed to a regular user of Smartsheet. In the event that the main SysAdmin is no longer with the organization, or is not available to manage the account, someone else at the organization would be able to login with this alias and make changes. Invite non-licensed users by un-checking both the Licensed User and SysAdmin boxes when adding a user (Click Account > User Management > Add User). There is no limit to the number of non-licensed users you can have on your Team, Business, or Enterprise account. You can assign non-licensed users to tasks and track their allocation in resource views. You can track non-licensed users' login history and system details. Non-licensed users are included in the Sheet Access Report and User List that you can download as a SysAdmin to review which sheets users can access. Inviting people to the account will prevent them from inadvertently entering into a 30-day free trial or purchasing their own subscription to Smartsheet. TIP: In some cases, you may want to transfer sheets to someone who isn't yet on the Team account. If you've reached your user limit, you won't be able to invite the new person as a licensed user. To resolve this, right-click on the person who currently owns the sheets, select Edit User, and remove the Licensed User access. This will free up a license so you can offer it to the new user. It will also temporarily make sheets owned by the user read-only until they have been transferred. Remove user sharing access: Use this option if the user has left the company or should be removed from all of your sheets for any other reason. 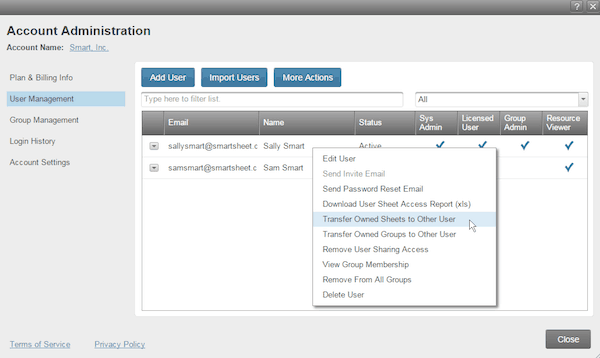 The user will still be able to login to Smartsheet, but will no longer have access to any of the sheets. Delete user: This removes the user from your Team, Business, or Enterprise account. The user will still be able to login to Smartsheet, but his or her account will be flagged as a separate free collaborator account, not associated with your Team. The user can purchase his or her own subscription to continue using Smartsheet if desired. If you’re interested in more specifics about managing users in your Smartsheet Team, Business, or Enterprise account as a SysAdmin, this article from our Help Center has more details. Can a managed non-licensed user be selected for and receive reminder emails? We have been using Smartsheet for a while but I am just learning about adding non-liscensed users. We currently just have everyone create the 30 day trial and share sheets with them, they continue to use the free account once the trial expires. Is there an easy way to grab the 21 people I have shared sheets with and turn them into non-liscensed users on our account (other than adding them one-by-one). What is the method for removing non-licensed users from smartsheet? Non-licensed users do not show up in the User Management module. We can only see licensed users and have the ability to remove licensed users. Can one sys admin delete another sys admin without their permission? What about admin deleting another admin? Does the SSO process work when adding users? I've been testing the process of adding users to our Team account, however when they receive an email to "accept" the team invitation, they are asked to create an account password, without given the opportunity to use the Microsoft Azure AD SSO process (as is available from the main Smartsheet login page). Is there a way to force the SSO process (so users don't get confused by the password creation step)? RE: Does the SSO process work when adding users?